Okay, quilters. The holiday season has started and we’re all beginning to plan out and piece together our Christmas quilts. But have you ever looked at a finished product and wondered where the techniques came from? Whether your mother, grandmother, or one of FaveQuilts‘ amazing YouTube tutorials taught you the difference between a quilt binding and a quilt border, you’re participating in a process that has been practiced and refined through centuries. Pretty cool, right? Well, it’s time to put all that knowledge to the test! 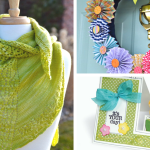 How much do you know about the art of quilting? Take our quiz, “How to Make a Quilt: Trivia Edition” to find out. Q: In what country did archaeologists find the world’s oldest quilt? The oldest quilt in existence is currently housed at the Saint Petersburg Department of the Russian Academy of Sciences. The quilted linen carpet was discovered in a Mongolian cave. Other candidates for World’s Oldest Quilt are an Egyptian leather quilt discovered on a carved ivory statue (dating to about 980 B.C.) and the Tristan Quilt (1360-1400 C.A.) in Italy. 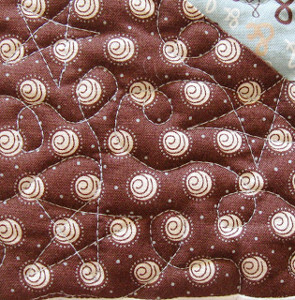 The Tristan Quilt, like this Stars and Loops Pattern, is a free-form quilt pattern which uses artistic stitching as the primary design feature. Q: Should you wash your quilting fabric before you use it? It’s always a good idea to prewash your fabric before you begin to work with it, particularly if you’re working with cotton. This way you can be sure that you won’t find yourself facing any unpleasant surprises that might ruin your beautiful finished product, such as bleeding or uneven shrinking. If you want to be sure your quilts are going to come out as neat and tidy as this gorgeous Sleeping on Squares Quilt, be sure to give the fabric a run through the washer before you begin to quilt! Q: But wait! 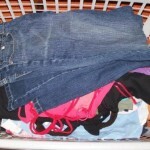 Prewashing fabric can lead to fraying. What’s the best way to prevent frayed edges? A: Cut a little piece from the corners. It’s true that prewashing can cause fabric to fray. 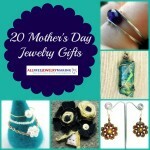 But cutting a little piece from the corners can help prevent fraying. 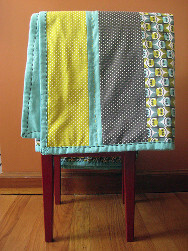 If you find that your quilt still looks a little rough around the edges, try adding a border or binding! 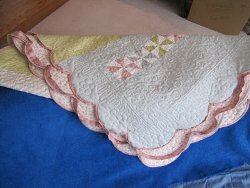 This gives a quilt a professional, finished look like the Scalloped Binding that you see here. Q: True or False – Using fabric scraps for patchwork quilts comes from Colonial America. Q: Which is the best type of needle to use in hand quilting: sharps, milliners, crewels, or betweens? Betweens are short and sharp, which make pushing through a quilt’s many layers much easier. They’re a bit tougher than some other needle options, which can help keep your hands from getting too sore! 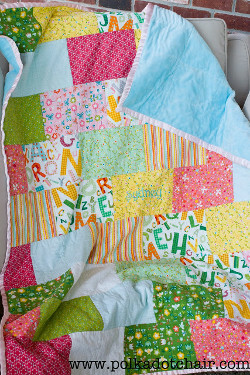 If you’ve never hand quilted before, the Fluffy Flannel Baby Quilt is the project to begin with. 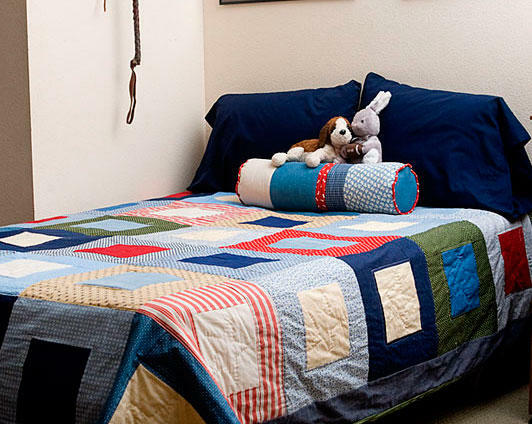 Go back to quilting’s roots by making this blanket the same way that your ancestors might have! During the Crusades, women used to sew quilts as protective armor to be worn under their husbands’ and sons’ chain mail. You probably won’t need to pad anybody’s armor, but a cozy baby quilt will go a long way to fighting off the cold! How’d you do? Tell us your score below!